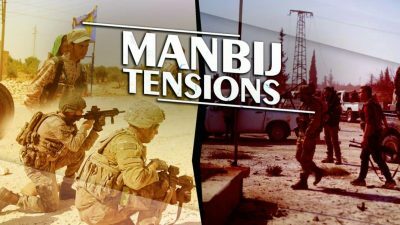 Troops of the US-led coalition have been clashing with Turkish-backed militants near the Syrian city of Manbij, currently controlled by the US-backed Syrian Democratic Forces (SDF), according to a video, which appeared online this week. Commenting on the incident to Kurdistan 24, spokesman for the US-led coalition Colonel Sean Ryan admitted that coalition forces “received gunfire from undisclosed persons and returned fire” on October 15, but avoided pointing the finger on Turkish proxy forces. Colonel Ryan added that the incident occured during a joint patrol of the coalition and the Manbij Military Council (MMC). Pro-Kurdish sources were more outspoken putting the blame on Turkish-backed forces and saying that the incident took place near the village of Bughaz. The MMC is a local entity linked to the SDF. It was established in order to hide the large presence of Kurdish militias in the area. The main reason is that Turkey, a NATO member state and a key US partner in the region, sees Kurdish militias as terrorists and as a major threat to Turkish national security. Washington is employing a wide range of measures, including the rebranding of US-backed Kurdish armed factions, in order to avoid further escalation with Ankara. Nonetheless, US-Turkish tensions over the so-called Kurdish issue remain high. October 15-like incidents are just further confirmation of the deep contradictions between the sides. Earlier this month, reports from both Kurdish and Turkish sources appeared that the US had started a new round of build up in northwestern Syria, which is occupied by the SDF with its help. Washington reportedly sent an additional batch of weapons and armoured vehicles to SDF units deployed near Manbij and expanded the number of US-led coalition outposts there. These developments came in response to repeated statements by Turkish President Recep Erdogan claiming that his country would kick off a military operation to expel Kurdish armed groups from the area near Manbij and from northern Syria in general. Meanwhile, the Syrian Arab Army (SAA) resumed artillery strikes on ISIS positions in the area of al-Safa in southern Syria. After the release of six hostages, the terrorist groups sabotaged further talks on the fate of the remaining civilians trapped in its area. So now, the SAA is employing a military option to force ISIS to release over a dozen civilians.